Maybe you like duffel bags, but can't deal with sore and painful shoulders anymore. If so, then a wheel duffel bag was just built for you! They are the next best thing - especially for weekend getaways and road trips. 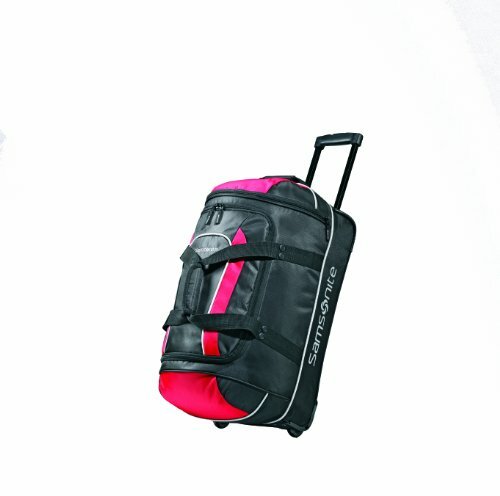 Wheeled duffel bags have the carrying convenience of a suitcase, coupled with packing convenience of plain duffel bags. Meaning that you can still pack all you can carry in them - but now you don't have to carry them anymore. In this review, I will tell you about the general advantages of wheeled duffels, as well as what you should look for in the perfect one for you. And then I'll show you the best wheeled duffels money can buy. So, what are you waiting for? Scroll down to find your next piece of luggage! A tiny pouch when not in use and an oversized luggage when it needs to be. The Eagle Creek No Matter What Rolled Duffel is and adventurer's dream when it comes to convenient luggage. It can pack 120 L of items and made with water- and abrasion-proof Bi-tech material. 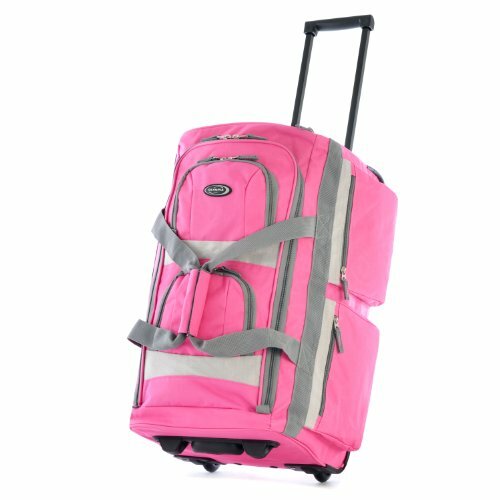 It comes with compression straps to stabilize the load, #10 lockable zippers, and rolls on oversized wheels for easy handling. It's a tough bag no matter what the adventure. While it seems like the perfect bag, one major thing it lacks is a frame. You roll the bag behind you with a cloth handle, taking the shape of whatever is inside the bag. It's really meant to primarily be a duffel bag that you can pull along when it gets too heavy. The good thing is the bag material itself doesn't slack, which means even a half-empty bag can be rolled with ease. On the other hand, the lack of the frame keeps this bag light at 1.5 kg and packable into its stuff pouch. 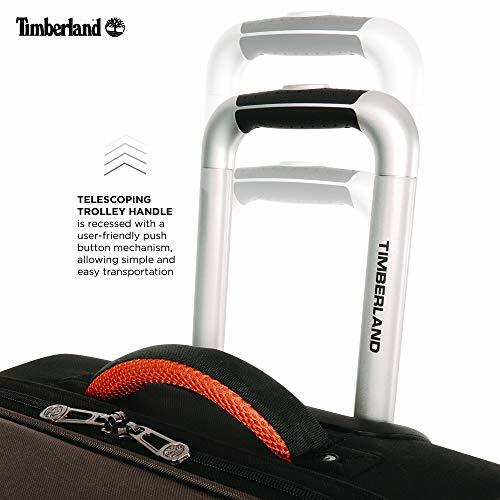 The Timberland Luggage Twin Mountain Wheeled Duffel comes in 22-, 26-, and 30-inch sizes. All variations have two separate packing compartments for better organization. Compression straps keep the items stable and compact. 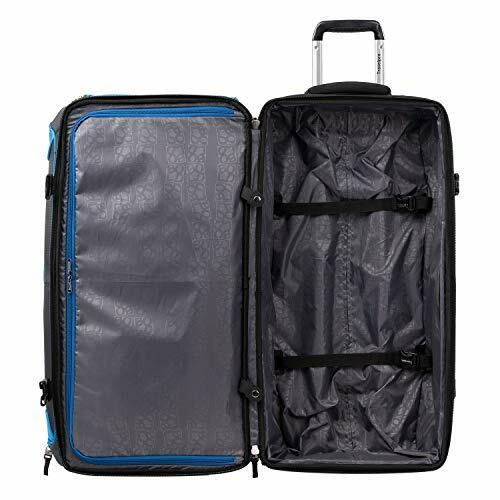 It can be handled as a rolling luggage or as a duffel with its side handle. It's made with 100% Polyester keeping the material thin and lightweight but durable and flexible. The interior is lined with plastic so wet items won't leak through the bag. There are several external pockets but when the bag is completely full, the smaller external pockets won't be able to fit anything anymore. The self-healing zippers take care of any overpacking problems when the zippers split accidentally. Wheels are stable and sturdy and a steel bar at the base of the bag helps support the weight of the bag. A burly construction and superbly water-resistant material sets the Patagonia Black Hole Wheeled Duffel apart. The wide compartment opening makes it very easy to pack, while its narrow wheelbase makes it easy to maneuver around crowded airports. The oversized 3.5-inch wheels will go through cobblestones, gravel parking lots, and even up flights of stairs. The handle extends in two stages and stretches up to 36 inches for easier handling. Together with its stiff frame and chassis, the you can slip on another bag over the handle and still keep the load manageable. Meant for the outdoorsy type, the bag has a daisy chain on all four sides to make it easier to attach to just about anything. It also stays upright even when just half-full. Pockets are a different matter, however. While there are enough to go around, they're not easy to access inside the bag. The large external pocket also becomes unusable when the bag is filled. It also goes very deep and will be hard to retrieve small items. There are two mesh pockets on the underside of the lid that can hold several quick-access items though, which might make up for it. 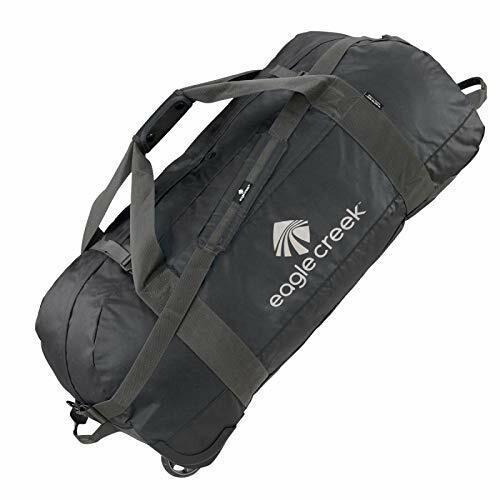 The Eagle Creek Gear Warrior is the ultimate gear bag for any outdoor sport and adventure. The Equipment Keeper allows you to strap gear to the top of the bag. It has lash points for gear attachment, and a secondary compartment to separate gear from clothes. The main compartment is also expandable and adds 15% more packing space, which is perfect if you plan on coming home with more than what you brought with you. Interior and exterior compression straps keep everything nice and stable too. The luggage features Exo-Skeleton technology to add strength and magnify abrasion-resistance, allowing the bag to be both durable and lightweight enough to carry as a duffel. When rolling over uneven terrain, its oversized and treaded wheels and bumper protection will get you through just about anything. Given all the functionality of this luggage, the main flaw are the plastic buckles. While a broken buckle won't completely affect the performance of the bag, the buckles on the compression straps and some grommets tend to be flimsy. 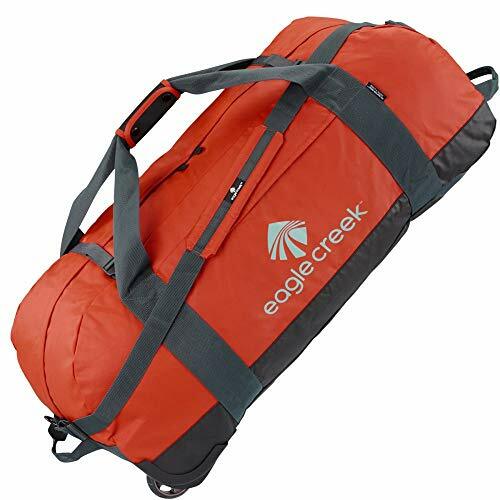 Nevertheless, this luggage is covered by Eagle Creek's No Matter What Warranty and any defect will be replaced. The Samsonite Luggage 22-inch Andante Wheeled Duffel is a great lightweight option that can serve as a carry-on. At 22 x 12.5 x 12 inches, it fits perfectly in the overhead bin of the plane. It's a softside luggage made of polyester, which means you can stuff this bag to its maximum capacity. It's very roomy with multiple internal and external pockets. There are two zipper closures that give access to the top of the bag and also from the side. On the downside, the soft material doesn't keep items very stable, especially with the lack of compression straps. It also doesn't stand upright as there are only two wheels and no base. When not rolling, the duffel will always have to be laid down flat as a duffel bag. For a high-quality bag from a top brand, this bag just goes under $30 and is great value for money. Olympia’s rolling duffel bag is a great affordable choice. You don’t have to spend hundreds of dollars to get a decent wheeled duffel – in fact, just $40 can get you a piece of luggage you’ll be able to use for years. There’s actually four different sizes to choose from for this bag, but I’ll focus mostly on the 29” one. And you can read more about the others in our detailed review of Olympia luggage. One thing that’s awesome about this bag is how lightweight it is – only 6.8 lbs for a 29” bag. And just to compare, a suitcase that tall would often weigh at least 2-3 pounds more. There are 8 different pockets on this bag, which make organizing your stuff a piece of cake. 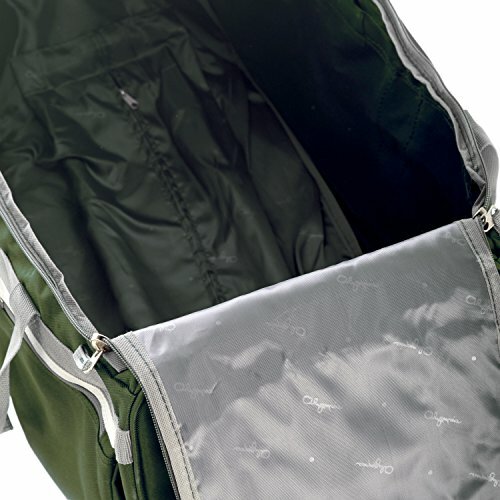 And the U-shape opening of the main compartment makes it super easy to access your things inside the bag. Plus, it also gives you a great overview of everything, especially when you compare it to duffels that have a single zipper in the middle. The telescopic wheel handle stores into its own zippered compartment when not in use, and it locks into position when extended. The grab handles at the top and bottom of the suitcase make it pretty easy to pick up this rolling duffel and store it anywhere. And the two joined carry handles are pretty convenient for when you just need to quickly move it from one place to another. The exterior of this bag is made from 1200 denier polyester – a durable and water-resistant material. It’s actually really great that the bag is made from such a thick material – it means that it won’t get ripped easily. Additionally, the bottom of the bag is slightly raised, so that the fabric doesn’t touch the ground at all when you’re rolling the duffel around. 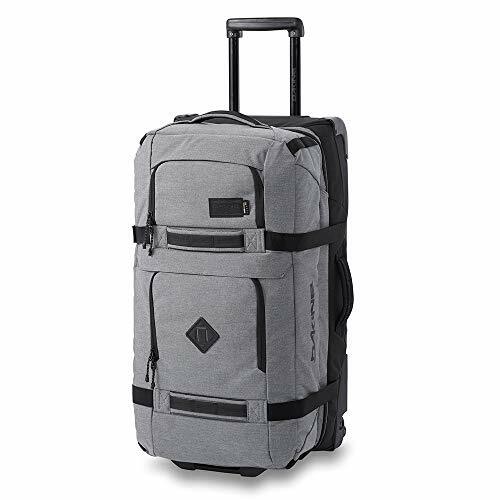 Size: 29" x 14" x 15"
The Dakine wheeled duffel bag is a great high-end option. It is one the pricy side, but it is definitely worth the money, due to its unique split-level design. And you can choose between two sizes – an 85L option and a 110L one. The split-level design means that this bag opens up like a hardshell suitcase, and you actually get three packing compartments. Wait, three? Yeah! The top level of the bag is split into two compartments, both of which can be closed with zippered dividers. The bottom compartment is pretty large, and features a full divider as well. One downside of this duffel is that it is not exactly lightweight – the smaller bag is 30” tall, and it weighs about 10 lbs. But an upside is that it has a collapsible brace – the frame allows it to keep its shape when you are packing, and you can easily collapse it when you want to store the bag. 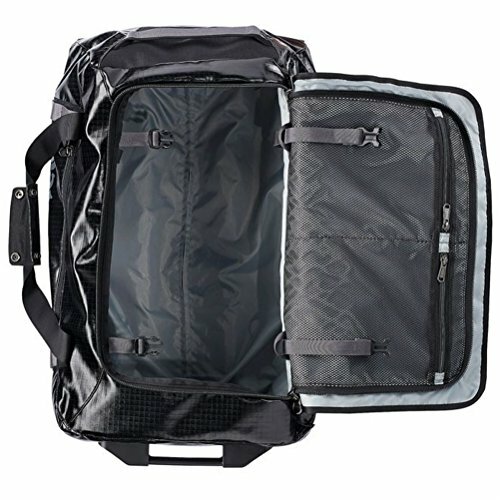 Overall, the Dakine rolling duffel bag is certainly an interesting option. It has some really unique features, on top of being made from premium materials. Those include sturdy, 600 denier polyester and locking YKK zippers, which ensure the safety of your belongings. Additionally, it also features external compression straps that come in handy when the bag is not fully packed. This wheeled duffel bag is another super popular choice. 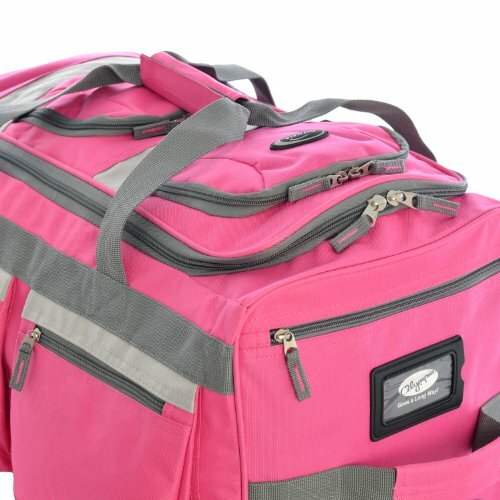 It has a spacious interior and lots of different pockets, so it is pretty convenient for organizing all your things. Plus, it’s made from high-quality polyester, which is really durable and coated with a water-repellent. 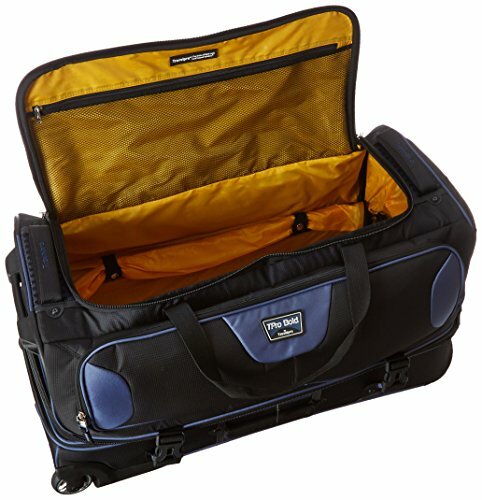 Similarly to the Dakine rolling duffel, the Travelpro one also features a split-level design. It opens up clamshell style into two packing compartments, one of which has a full panel divider. But unlike the previous bag, this one can also be opened up from the very front of the bag. And, you can also unzip that divider, and turn the interior of the bag into one huge packing compartment. It’s a versatile wheeled duffel, you have to give them that. 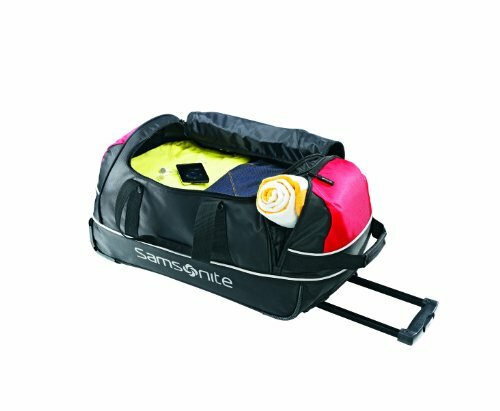 There are internal compression straps in the bottom compartment, which help you tighten the load of the bag. And the bag also has external compression straps – sort of. There are buckles that go over the zipper that connects the top and the bottom level. They can be slightly adjusted, but there are no straps that go over the entire exterior of the bag. The wheel handle is retractable, has its own zippered compartment and locks into position when extended. 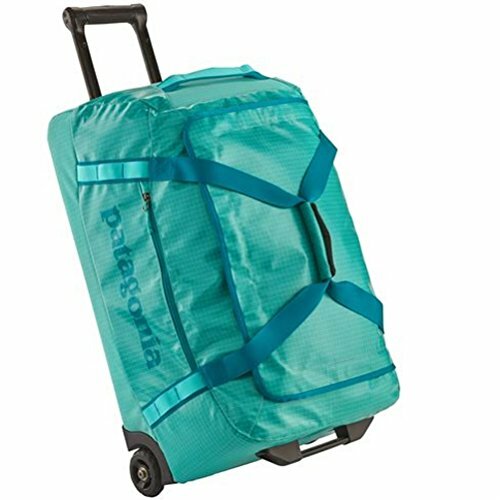 In addition to that, this rolling duffel has grab handles at the top and the bottom, which make picking it up super easy. Plus, it also has little legs on the bottom, that ensure it won’t tilt over when it’s upright. Wheeled duffel bags can range from small carry-ons to enormous carry-alls. Remember that the point of having duffel bags with wheels is to let you both roll the bag when you can and carry it when you should. Find the right size that will fit all your things but still be manageable enough for you to lift off the ground. Wheeled duffel bags tend to experience more wear and tear. People who use these usually take these bags through different kinds of adventure. Some materials are also waterproof which is great for outdoorsy types, but make the bags a little heavier. Lightweight polyester keeps the bag manageable but won't provide that much protection in terms of weather elements and structure. Make sure the materials of your bag fit the kind of travel you do. Obviously I'll try to show you only duffels made from high-quality materials - what's the point of getting a wheeled duffel bag if it's going to rip after just a few trips? One thing you should know beforehand is that I do not recommend these for air travel. Maybe as carry ons, but only if you get a really small bag that you can fit under the seat. Just think of what happens to a softshell suitcase after you've checked it. And those are made from sturdier materials then duffels bags, plus they often include frames and corner reinforcements. Now, imagine what your duffel bag would look like after being thrown around by baggage handlers. If you're in need of a large checked suitcase, I strongly suggest you consider investing in a hardside. Why A Wheeled Duffel Bag? There is so many different types of luggage you could buy. So, why exactly should you be considering a wheeled duffel bag? Why not a suitcase or a backpack? The answer is simple - organization. Duffel bags are generally more convenient for people who like to organize their things. They usually have lots of pockets, and sometimes even several packing compartments. Which makes them an awesome choice if you're sharing luggage with a partner. You get your compartment, they get theirs, and everyone's happy. But why a wheeled duffel? Aren't they bulkier and heavier than regular duffel bags? Obviously they are. However, that is actually an advantage, if we are talking about the larger bags. When you fully pack a duffel with a capacity of 120+ liters, you will throw your back out trying to get it in the trunk. And imagine having to carry that around in your hands - I would probably give up after 15 minutes. Wheeled duffels are easy to transport from one place to another, and they often have several grab handles. Those make it so much easier to just grab them by the sides and throw them in the trunk of your car, or the overhead compartment of your train. And you never have to carry the thing on your shoulder - you can just drag it behind you like a regular suitcase. Wheeled duffel bags are convenient and versatile. It will pack a lot of stuff and give you options on how you can handle your bags. When traveling to a place with varied terrain, the Patagonia Black Hole Wheeled Duffel will roll over any obstacle. With oversized wheels and tough materials, this bag will withstand rough conditions too. It's also lightweight enough that carrying it over your shoulder won't be a problem either. 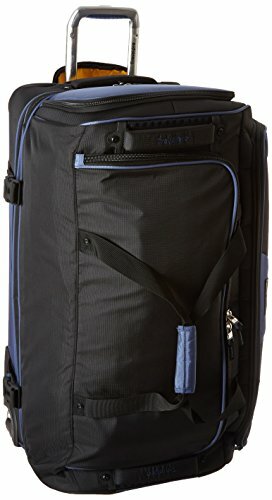 The Samsonite Luggage 22-inch Andante Wheeled Duffel is great for light travels or as a secondary bag. It's lightweight and roomy and will be easy to maneuver through narrow plane aisles. For serious travels that require everything but the kitchen sink, the Eagle Creek No Matter What Rolling Duffel fits the bill. Extra-large and extra-tough, this duffel can take whatever you throw at or in it. Despite the lack of frame, this duffel can roll just as well as a framed option when full. EXTERIOR. Bi-Tech fabric makes this duffel abrasion resistant and weatherproof, with a protective storm flap to shield gear in tough conditions. Tough webbing and strategic seam reinforcement in high stress areas with versatile carry options give this bag a high strength to weight ratio. For your security and peace of mind, exterior zippers are lockable. TREADED WHEELS. 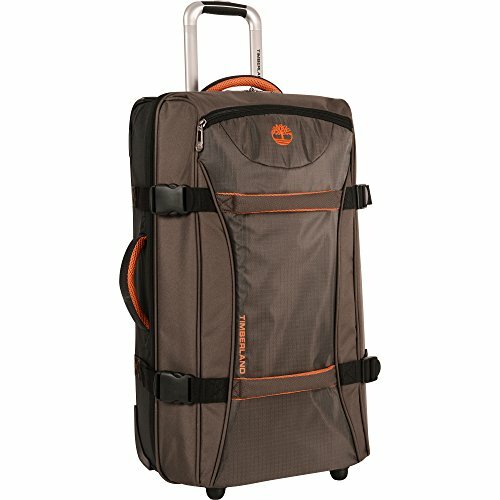 This wheeled duffel has oversized, heavy-duty, treaded wheels in a protective wheel housing and a durable kick plate for smooth mobility and maximum durability. Easily maneuvers through airports and hotels, as well as over unpaved, bumpy, or muddy surfaces. 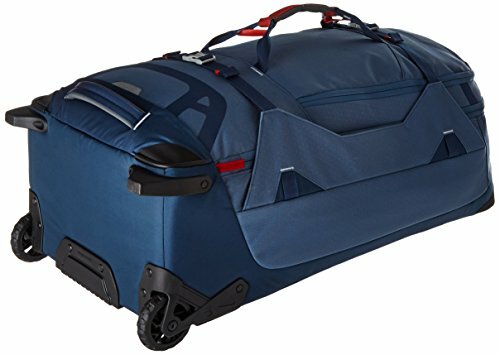 I hope this post helped find just the right rolling duffel bag for you! And if you're still not sure whether it's this type of luggage is a good fit for you, check out some of our other posts - they can certainly help you figure out what's the right choice for you!